And if you are still in captivity sweet legend “Esterhazy”, let’s move to Vienna to meet with another legend – Delicious Sacher cake , which is also undeniable symbol of the Austrian capital. It is believed that the legendary cake was created in 1832 when a young pastry chef named Franz Sacher, who was replacing a sick cook, prepare this dessert for a new Austrian Foreign Minister Metternich. 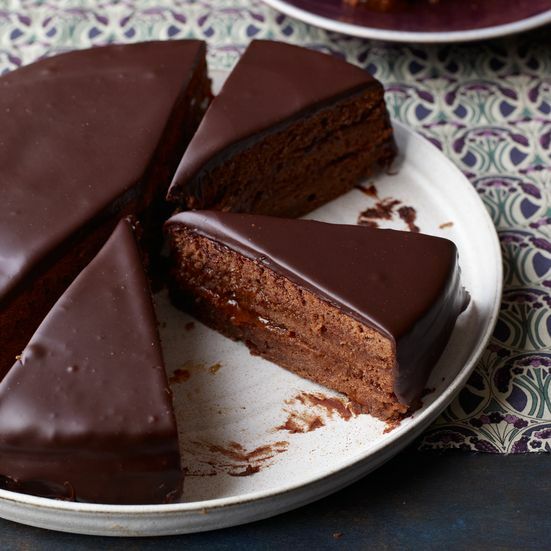 In fact, chocolate cake with chocolate icing is not new Austrian cuisine and these recipes have appeared at least a century earlier, but this is history. Incidentally, the modern version of Delicious Sacher cake is not the work of its creator and his son Edward, who collected culinary experience in Vienna Café “Demel”, and then founded the hotel, which gave the same name and it sold famous cake. However, the confectionery brand “Demel” was purchased, leading to several lawsuits between the hotel and bakery. 90 ml. water (for sugar syrup), whipping cream. Separate the egg whites from the yolks. Beat softened at room temperature butter with powdered sugar, vanilla sugar, add egg yolks and melted part of the chocolate (150 gr.). Beat egg whites with 200 g. Sugar and stir gently with a chocolate-butter mixture. The resulting chocolate dough bake in a greased and floured form at about 180 ° C for at least 40 minutes. All again depends on the oven. After baking the thick crust is better to stand for several hours. The finished cake is cut in half for top turns with the flat side out. The latter must Brush with slightly warmed apricot jam and allow to cool well. Then put the products to the sugar syrup (water and 200 g. Sugar) to be heated and meanwhile add inside the broken dark chocolate. Stir until complete melting and formation of a uniform coating. 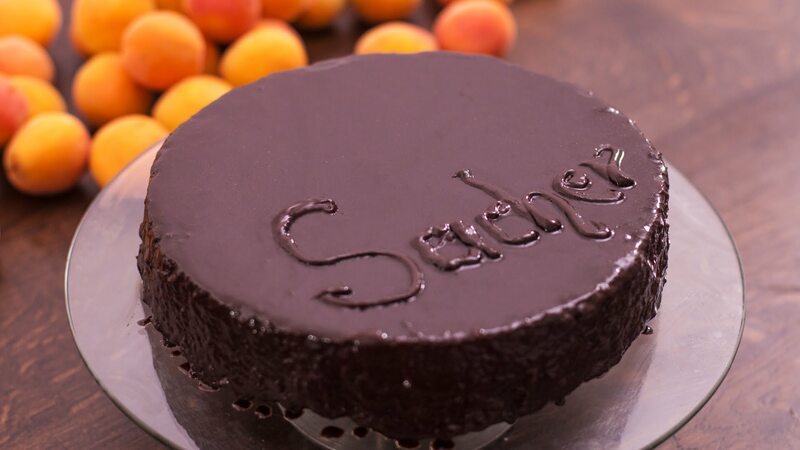 This pour glaze the entire cake, leaving a small amount of it for the legendary inscription “Sacher”. Serve this beauty with whipped cream.